Get laser-quality text using the HP 940 Magenta Officejet Ink Cartridge. Print professional, plain paper documents that resist water and fading, using pigment inks designed for the office. Archived documents retain black text quality for decades. Individual colored inks and a high-capacity black ink cartridge option offer a great value. The HP 940 Officejet ink cartridge is compatible with the following HP printers: Officejet Pro 8000 and Officejet Pro 8500 All-in-One. The cartridge yields approximately 900 printed pages. 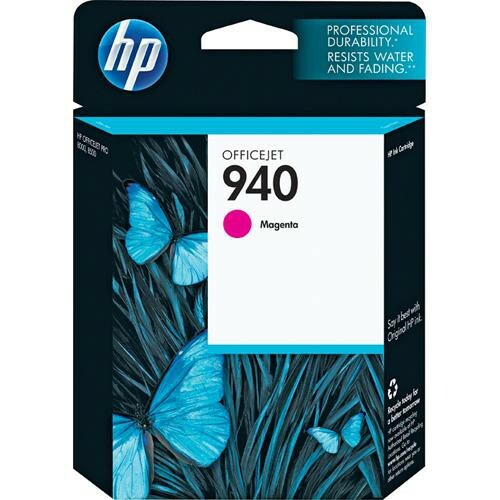 Box Dimensions (LxWxH) 6.25 x 4.65 x 1.0"
940 Magenta Officejet Ink Cartridge is rated 4.6 out of 5 by 9. Rated 5 out of 5 by LindaTF from works as advertised the cartridge came so quickly and fit right in and fit in the printer, as promised by the store 'scanner' thingy. So it was quick, easy, and the correct item the first time. Rated 4 out of 5 by lucylou from not sure yet I wonder why this cartridge ran our so soon. I bought the printer in Feb.and it ran out in May. Rated 5 out of 5 by TopCat15 from What's to say about an ink cartrige. It just works HP Cartridges just work in my HP Officejet Pro without causing problems with the printer. Rated 5 out of 5 by Deborah from Works just fine. Works fine. Just wish it lasted longer (as with all inks). That's the way with ink. Rated 5 out of 5 by homegirl from +++++ this product is suitable for my needs . I don't have to print many pages.